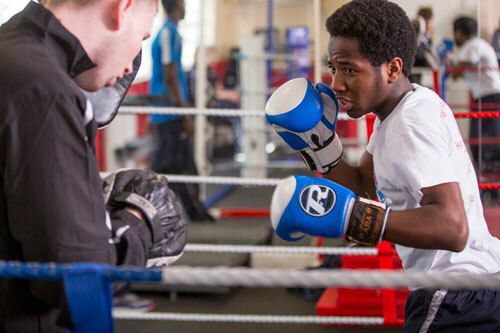 The Boxing Academy is a nationally-recognised school, with the ethos and feel of a boxing gym. It has developed a unique method for engaging vulnerable and challenging students. Since 2010, 90 per cent of them have progressed to further education, training or employment. It was founded on the principal belief that exclusion from school is an inefficient method of dealing with behaviour in education. It has a detrimental effect on the child, the family and the wider community. Generally, Boxing Academy pupils have been referred because of a tendency towards violent or aggressive behaviour, and are usually the most difficult to place. The Academy employs an intensive mentoring system within a framework of small class sizes, high-quality teaching, personal support and daily exercise to help even the most difficult-to-reach children reengage with their education. Daily boxing training delivered by ex-professional boxers means pupils can expend their energy purposefully, and learn teamwork, discipline and the acceptance of authority – but there is no contact sparring and they do not compete. It was underachieving when its current chief executive was appointed at the end of 2009 and undertook a complete review of strategy. All staff were consulted and contributed to a plan for growth. As a result outcomes have improved year on year. Forty children are currently enrolled, including four girls. School attendance has risen from under 60 to 91.5 per cent. Around a third of students gained passes in English and Maths GCSEs in 2010 while last year 80 per cent passed five GCSEs. Some 90 per cent of the 250 alumni since 2010 are still in education or employment. But most tellingly, while the ‘not in education, employment or training (NEET)’ figures are almost 20 per cent in Hackney, in 2015 100 per cent of Boxing Academy pupils went on to college. The Academy has received recognition through numerous awards while independent evaluation by the Laureus Foundation estimates that the charity has a social return on investment value of 3:1. It will convert to ‘free school’ status later this year as that has been identified as the best way of replicating the model elsewhere. Charity Awards judge Samantha Sparrow, director of Task Squad at vinspired, said the Academy’s entry was “extremely impressive, with a fantastic record of never turning anyone away”.